It actually took ages since we did the interview with Thomas Gold back in 2010 before his first release on Size named “AGora” till we saw him live for the first time. On saturday of last weekend, 8th December, right after the Swedish House Mafia gig in Frankfurt – review plus footage coming soon – we drove the way to Hamburg to attend to Thomas gig of his FanFare Worldtour at Halo Clubbing in Hamburg. It was Thomas second gig this year at Halo and to make it simple, it was a huge night! Before Thomas started his set, we had the chance to talk to meet him and chat with him. For the fans out there, he is, of course, working on new material for Axtone – including some fresh vocals – and of course he is is making a lot of edits. Besides tracks we talked about the aiaiai TMA-1 headphones, touring in the US where the crowd seems to be really good and the club life in Germany. At about 1.45, the club was packed, “Marsch Marsch” started as Thomas Gold‘s intro and from this point, the crowd really went nuts. We’ve experienced a couple of gigs so far and till this time the best gig in Germany I (Tobi) attended to was when Eric Prydz played at Bootshaus in february this year, but this event definitely is ahead by a nose. The 2,5 hours long set was intense and absolutely powerful from scratch. 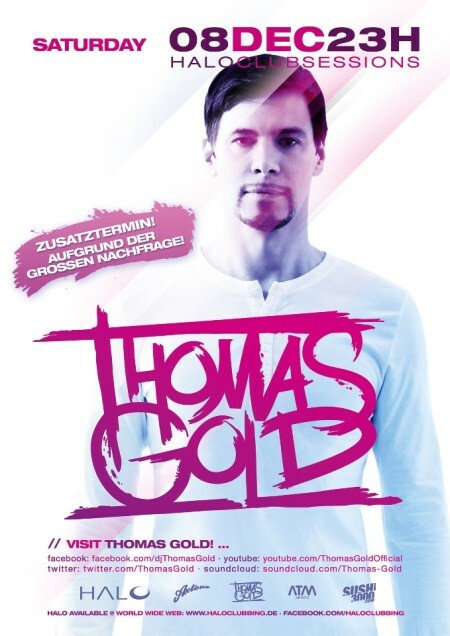 Mr. Gold played a lot of great edits, remixes of his own and tracks like “Don’t you worry child”, “The Universe” remixed by David Tort, his own remix of “The Wave” which is one in our opinion one of the highlights in 2012 or “In My Mind”. We won’t tell you a whole tracklist as we think the videos below will speak for itself. Track questions can be asked on youtube. Thanks to: Thomas Gold, Verena, the DBN guys & Matty Menck who we met at the club as well and Michi!